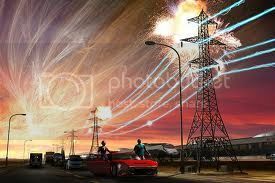 ElectroMagnetic Pulses (EMP) are something that sounds like they came out of a science fiction story. However, they are real and a threat that should be taken seriously. There are two types of EMPs, man-made and naturally occurring. While the man-made versions require a lot to make happen and are, thus, more unlikely, there are still naturally occurring threats that need to be taken seriously. The Washington Examiner released an article earlier this week that explains how earth missed a massive solar flare two weeks ago that would have caused a large EMP effect on our planet. Earlier this year I had the opportunity to attend a seminar on EMPs, their reality, their threat and their likelihood of happening. I drafted a report based on these topics to also include some recommendations on preparedness steps you can take to mitigate the effects of an EMP. As with all potential threats, we encourage you to become a ReadyChristian. This FREE downloadable training will walk you through a proven process to develop Biblical Readiness to be ready for any crisis or disaster you may face and to know how to help others through an emergency. We also invite you to join us for a FREE One Hour ReadyChurch Webinar which will start you on the process of developing preparedness within your local church.